The Beast from the East has played havoc with spring flowers and early vegetables. 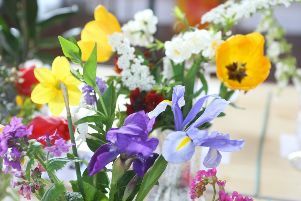 Rustington Horticultural Association members certainly suffered in their attempts to grow entries for this year’s spring flower show, held on Saturday. Show secretary Alison Valentini said: “The daffodils got knocked down by the snowy, frosty weather and although they are hardy enough to pick themselves back up again, the weather has taken its toll and many of the flowers are very late this year. “As a consequence, the number of entries was significantly reduced this year, down by almost a third on previous years. Artistic exhibitors provided magnificent examples of handicrafts, photography, cookery and floral art, giving plenty for visitors to see while enjoying tea and cake away from the chilly weather. Alasdair MacCulloch, Presidents Challenge Cup for best exhibit in horticultural sections, Daffodil Society Bronze Medal for best single narcissus bloom, Gilbert Parry Challenge Cup for best vase of narcissi, and Spring Challenge Trophy for most points in narcissi and flower classes. Mick Marshall, Menage Cup for best vegetable exhibit. Babs Blake, Jack Hesling Trophy for best novice entry in narcissi. Anne Adams, Cactus and Succulent Cup for most points in cactus and succulent classes. Sarah Oldfield, Chef Challenge Cup for most points in cookery classes. Linda Allardyce, Bobby Knee Cup for most points in handicraft classes. Claudio Valentini, Glass Goblet for best exhibit in photography and art. Abi Pendleton, Youth Challenge Trophy for most points in young persons classes and Knight Cup for best young persons exhibit. Carolyn Clark, Mandy Gait, Sylvia Hesling, Nick Hockey, Isabelle Layt, Julie MacCulloch, Valerie Narayanaswamy, Kathy Oldfield, Carmel Pardi, Sue Rylands, David Stubbings and Alison Valentini.